As you can deduce from its name the Västra Vätterleden leads you around the Western side of Lake Vättern. 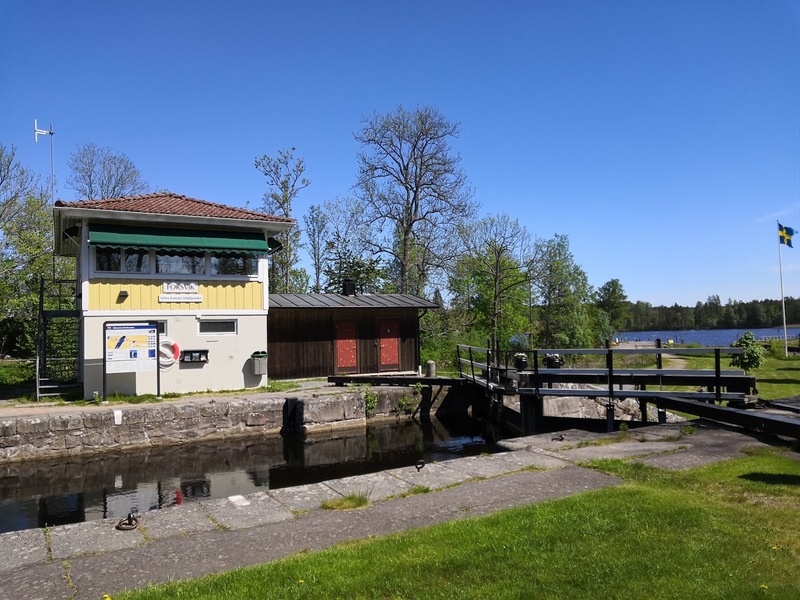 For me this was a trip back in time because it also brought me back to the Göta canal which I had paddled some years before. I even remembered getting water at this lock which I did again on this trip. I had paddled here in October in rather cold temperatures whereas now I had not seen a single day of rain on this trip! I recharged my phone in the public toilet and had to seek shadow for my lunch break because it was so hot! Apart from this short stretch along the canal I was constantly hiking in forest now. Open shelters are located at regular intervals along the trail mostly situated at really idyllic lakes. And because of the continous hot weather I was soon able to take a swim several times a day without freezing. 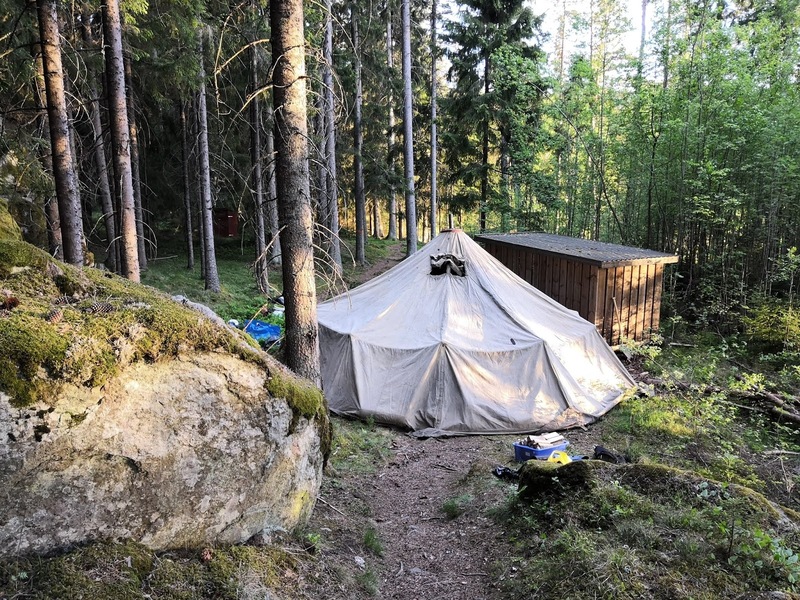 Because of several public holidays in May there were lots of people out on the trail - very few other hikers but fishermen and even a big religious youth group with a huge tipi. When I encountered them in the evening right at the shelter where I had intended to sleep that night I had some rather unreligious feelings. I had to hike on to find another suitable campsite. 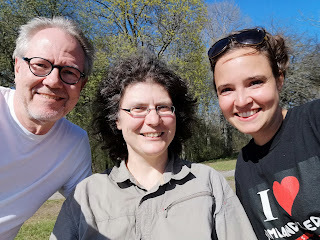 I also came across several Christian-run campsites along the trail one of which turned out to be a fantastic place for an extended lunch break in the shade! But not only other people where occupying the free shelters: Several times wasps had built their nests right in the wooden shelter. 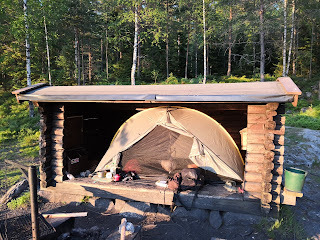 I usually set up my tent inside the shelter anyways to protect myself from mosquitoes but hearing the loud buzzing of wasps and hornets made me nervous at night. I also encountered a surprising amount of snakes on the trail: adders and slow worms. I had not expected them so far North. Because it was so dry luckily mosquitoes were not a big problem. I also had a full rest day in a nice AirBnB place in Örebro which is only a short bus ride away from the trail. Buses run every half hour along the motorway making it easy to go resupplying there. Both trails are marked pretty well and there were even English trail brochures with maps on the internet. But in areas with recent logging activities hiking was no fun: no markings and sometimes badly overgrown trail. 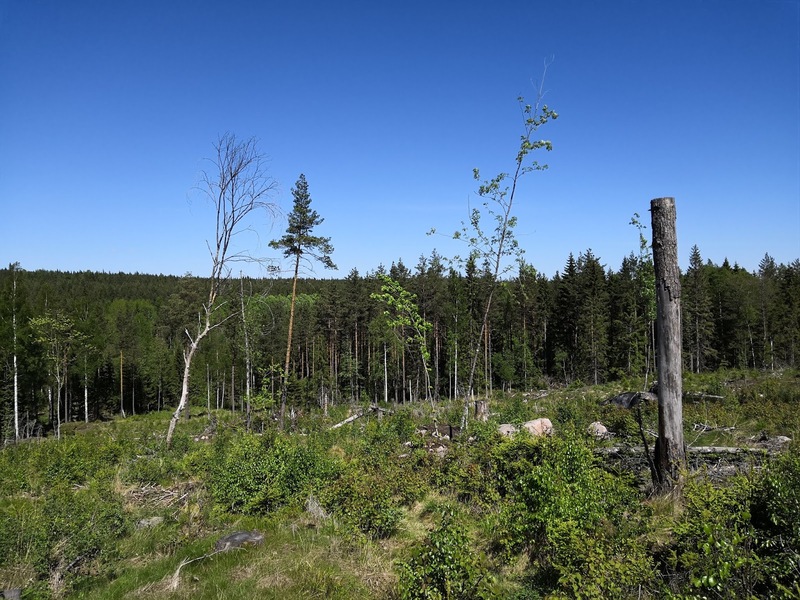 I must also admit that I started to get fed up with all the trees especially since the Bergslagsleden does several long twists and turns which can be short cut - which I did .... Still the Bergslagsleden was a real highlight of this trip with all the wonderful lakes and shelters. Beside Stefan I did not see many other hikers on it. Here you are not far away from civilisation but you definitely don't feel much of it! My trip started with work! 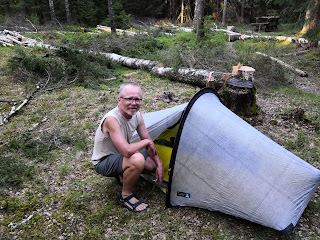 Jonas Hallen and Jörgen Johanson, both Swedish ultralight hikers, had invited me to do a workshop on long-distance hiking. Very easy task - I just showed and explained the equipment that I had brought for my upcoming hike! When Jörgen and a friend picked me up from Stockholm airport they told me that I had arrived at the first day of spring after a long winter. Perfect timing! After this prelude I took the train to Gothenborg and started hiking the E1 northbound from there on May 7th. The E1 uses existing trails - some of them well known, but also some local trails. This brought me to the Sjuhäradsleden. 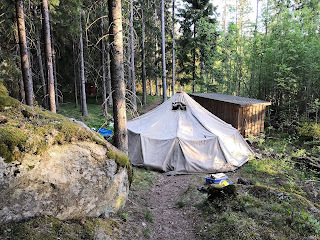 Although it was nice to be out in the woods again, the Sjuhäradsleden is definitely nothing to write home about. It is mostly within earshot of a major motorway which made finding a quiet camp site at night rather difficult for me. But as a nice surprise I got company! Knut, a veteran E1 hiker who had already completed most of the trail in Italy and Norway, camped with me one night. 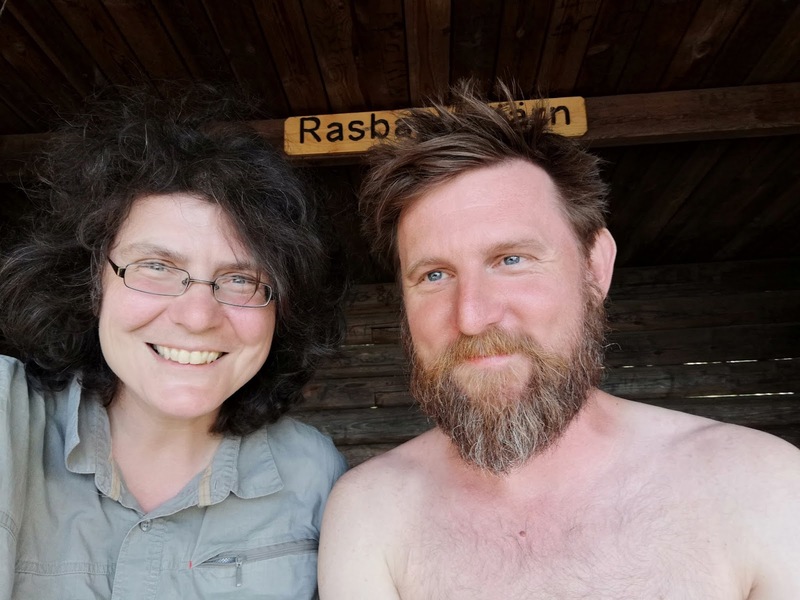 As I prefer to hike alone we split up again but I met Knut again at the end of the Sjuhäradsleden in Mullsjö where he took the train home to Oslo for a short holiday from the holiday. Knut had managed to get a shower before boarding the train whereas I was still dirty and smelly after my first week of hiking. Therefore I was a bit reluctant to give him a good bye hug. But Knut just smiled and said: "You don't smell bad. You just smell like a real hiker!" I guess he is right .... And I managed to get clean very soon as well because Mullsjö was my first rest day on this trip which I spent in a rather posh hotel.